>J was born into a trading community in undivided Bengal. She grew up with a unstable mother, a nervous father and five or six siblings. As was the custom in her community, she was married off quite early to a man twelve years older to her in the same community. Barely did she attain puberty, she was pregnant with a child and from this point on, her life took an altogether different turn. Her mother and her husband both died suddenly in an attack of small pox, which those days was endemic; J flabbergasted by this turn of events, lost her mind and was locked up in a room probably under advice from the local medico. She gave birth to her daughter but could not look after the daughter due to her illness and her mother in law looked after the infant. It is not known to me for how long J lived in that hazy, misty world of hers, for when she came to our house, she was nearly forty years old. All these stories about her is her recollection of her past, which would be presented to me by her differently at different points of time; sometime with a bit of spice and sometimes in bitterness, in anger and in utter deep anguish. But I could guess how she may have passed her time, what did it take for her to get out of that strange world of depression, part manic, part delusional world of hers. She says when she felt better, she resumed her husband’s money lending business to local traders, looked for a suitable match for her only daughter who was in her early teens and got her married off. Since she came from a middle class family(not educated much but with enough money from trading in the joint family business), life should have sailed smoothly thereafter for her; but it was not to be. One fine morning, her daughter’s father in law (who was a small trader) disappeared leaving his family in debt and despair. Her son-in-law took to drinking and drugs, her daughter came back to J with a little baby boy. While J’s brothers in laws were supportive to begin with, over time they started making their displeasure clear to J that her married daughter with a child were not welcome here, especially when her costs are being shared from the joint family kitty. By this time, J’s money lending business was usurped by J’s mother in law and that left her with very little money of her own. So, for the first time in her life, a housewife and totally unaccustomed to the big bad world outside, J decided to work to support her daughter and her grandson. The only work that she could find was of domestic help, cooking, etc. Her first job was in Bihar in a older gentleman’s house and his joint family. J learnt to cook, to sweep, to swab, to do all household chores that she was not required to do back at home. Three years passed, J settled down in her job and was able to maintain her daughter and her family who now had two kids. But life had other plans for her. Her toddler grand daughter passed away and her daughter became distraught, unstable and left home never to come back. 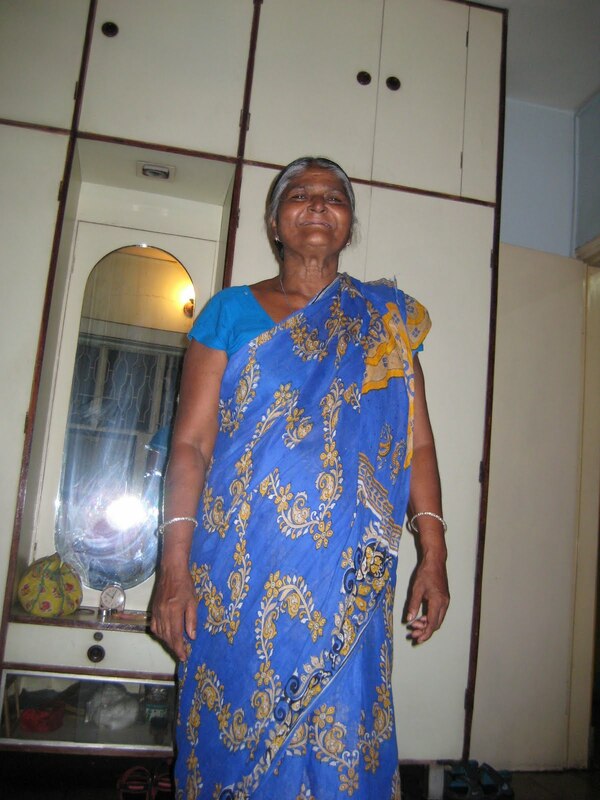 J decided to come back to kolkata to look after her grandson and take up the job of a domestic help here. This is how she came to our family as we were looking for someone to cook and live with us as I was expecting my daughter. I was working at that time and having someone at home to cook and look after the house was a necessity. J entered our lives twenty six years ago and she is still around – I am so grateful that she is around although living with her is both a trying as well as a comforting experience. J is the pillar of strength and the source of irritation that I have always had around me. Her being around meant my never having to worry about the safety and nurturance of my daughter, about the maintenance and upkeep of home, about taking care of my father, about our three pets and the rest of the household, i.e. me and my husband. She knew exactly who needed what and what needed to be done when. She ensured that the part timers were doing their job well and she had the best interest of the household at all points of time. She made my life hell through her over demanding, over inquisitive and over dominating nature. She had the answers to all questions asked, she offered advice to every problem that we ever faced irrespective of its personal or private nature, she wanted to take leave the minute she knew I had to attend some important meetings, she decided what was best for home and for my daughter whether I agreed or not and she constantly sniggered at my attempts to be a good mother by trying to read up on child rearing or seeking advise from others or trying out something new. In other words, she filled all the voids for the “fault finding mother-in-law”, the ‘over nosy aunt”, the “very critical aunt-in-law” and all the stereotypes that one can ever imagine. I have not had too many supportive women in earlier part of my life and during my married days, had very little support from my in laws in all sense. While I could manage not receiving emotional or any other kind of support from them during my marriage, managing home and a child without any help was very difficult. This was the time when J turned out to be my biggest support and strength. She was always there with me especially when I was confused, afraid, distraught about being a new mother, about being a ‘bad’ person in my fragile relationship with my husband, about being a ‘anxious employee’ in my marketing job, high work pressure, late nights and frequent travel and tours. She would stay up the night if needed and in the morning would take charge of the kitchen without murmuring a single protest. It was as though I could always depend on her and she showered us with her love, affection, attention and her demands. One small example of this is that J comes from a Vaishnavite faith; the family i married to were christians and naturally the food habits were very different. J’s family did not touch even onions, and at our home, beef and pork were much loved. Since our daughter loved meat, J decided to cook whatever she wanted even it meant that she had to do penance every time she went back home. J did not do this because she wanted to show off how great she was but because our daughter loved them, and her wishes ruled J’s world. I don’t how much else can I write about J; she is nearly 70 years old and she still works. I have offered her to sit at home and get a pension from me but she chooses to work for my ex-husband as it still offers her a place that she can call her second home. Her life has not become better despite her hard work all these years, building a house for her grandson, getting him married off, taking care of his family and his two kids with her hard earned money. Her grandson has turned out to be like his father, an alcoholic and a waster. While my heart bleeds for J, I also know how much is she responsible for not letting her grandson become a man on his own, how much she spoilt him, how much control she had of his life and when predictably he has given up, she feels angry, helpless and sad both for herself and for him. I keep telling her I am there for her, and she knows it too, but I can never replace what her heart’s desire was; to have a home of her own, to be owned up by her own people, to be looked after and respected by them in a peaceful and stable set up where she could call the shots but need not be the bread earner. In all of these twenty six years, J has become an integral part of our lives much to the chagrin of many of my relatives who thought I was giving more important to a servant as compared to them. But to me, J was and still is part of the family despite her over dominance and her annoying self. She in many ways is my only relative or a family member who has taught me how to make a family, she taught me how to unabashedly own others, how to shower love and affection with all its associate irritants, and how to expect the same things in return and to not feel ashamed because you want them. She taught me what it means to claim space, to make people belong to you even when they were not one’s own, how to belong with a passion and with a commitment that only a home maker can do and how to make a brick and mortar house into a space called home. >We had someone like that at our home too. A child widow who was at the hospital when my eldest brother was born and she then came home and was with us for almost 50 years. She was part of the family, and like J took her role so seriously that it was annoying at times. She passed away about 10 years ago. >@radha: yes, they do, don't they? and I guess this is their way of making a home for themselves. >Nice blog & good post. overall You have beautifully maintained it, you must try this website which really helps to increase your traffic. hope u have a wonderful day & awaiting for more new post. Keep Blogging! >@Maria: Thank you Maria, that is certainly encouraging. Will visit the site. Look forward to more of your visits. Take care and stay well. >She had a sad life. I feel sad about how she was not supported when her daughter needed her – she had to look for work. 😐 And then the same toddler, growing up and losing her daughter and disappearing!! What happened to her daughter…?! I hope she finds the happiness she seeks and her grandson doesn't disappoint her too much. >@IHM: Unfortunately her grandson has turned out to be a disappointment to her. He has turned into an alcoholic and a waster; he also blames her for over controlling his life, for getting him married off, etc. Hence she has to take care of the wife and the two children. I help her whenever she asks me but that is never enough. She has not received what she so fervently dreamt of and worked towards. Sad life indeed. >This is a lovely post. While you have written beautifully about J, what shines through is your ability to have nurtured and maintained a relationship between two disparate individuals through the common bond of womanhood. You took all the badgering with a smile for you could see the sunshine. Kudos to you my dear for nowadays tolerance seems to be dissipating with education and economic progress. >@Sharmila: thanks. not sure whether i have been tolerant to her most times. we used to have lots of petty fights and arguments and it was not pretty. but what you write about the bond between two women are so true and it is easier to see this in retrospect and so are my empathy, love and respect for her. thank you for visiting my blog, joining as a follower and leaving your comments. Keep visiting, it means much to me. >A very touching story but true of so many women in India. You tell these stories so well and bring the people to life for us with all there virtues and faults. Your honesty is something that I'm always impressed with Sharbori……..Take care. >@Corinne: thank you. And I am moved by your faith every time I read your blog! >@zephyr: thank you. great idea to work on. >@dropzofjupiter – thank you. look forward to more of your comments. i have been following you for a while now.